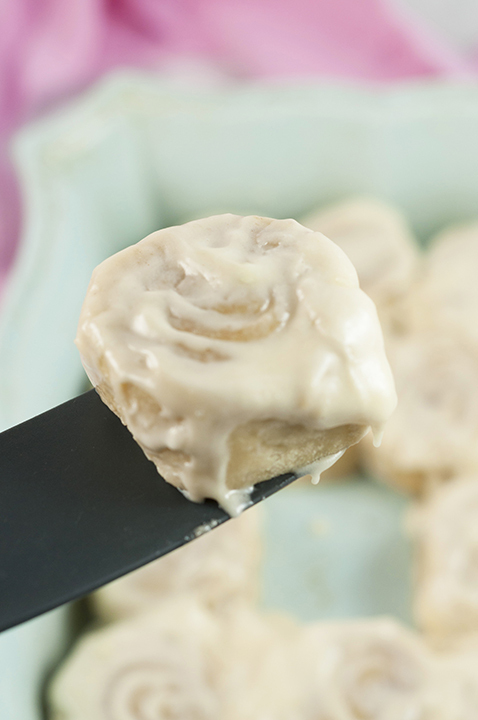 Copycat 1 Hour Cinnabon Cinnamon Rolls smothered in cream cheese frosting are the perfect recipe for an easy Easter morning brunch, Christmas morning breakfast, or any weekend you make an extra special and easy breakfast for the family. They taste just like Cinnabon bakery and only take one hour! You are about to be in cinnamon roll heaven here. If you loved my Carrot Cake Cinnamon Rolls last year, you’ll love these possibly even more. My kitchen is now down for the count as we are doing some major renovations. Nesting at it’s finest, folks. With all we have to do to get ready for the baby, we figured there is no better time than now to renovate our kitchen. I guess this is better than waiting until after the baby is born, though! I made sure I got these Copycat 1 Hour Cinnabon Cinnamon Rolls in before my precious kitchen was in shambles. An unusable kitchen is a food blogger’s worst nightmare, let me tell ya. If you’re trying to come up with an idea for Easter brunch, breakfast, or a really special weekend breakfast to have on any holiday then this one is for you. Who wants to spend 3-4 hours on cinnamon rolls? Everyone loves the famous Cinnabon rolls at the mall and these taste just like them! I make the Pioneer Woman’s homemade cinnamon rolls once in a great while, but they are a big time commitment. Homemade cinnamon rolls are always worth it, but sometimes you crave them and need a quick fix. 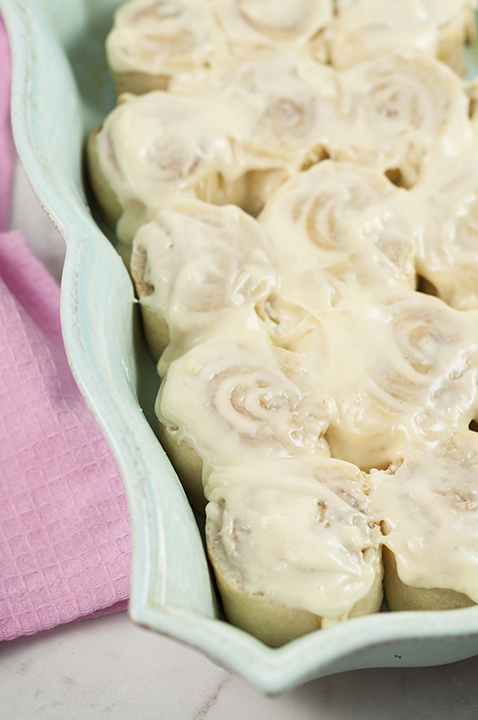 These Copycat 1 Hour Cinnabon Cinnamon Rolls give you that quick fix! I know it’s crazy to be thinking about Christmas right now as it is March, but it’s snowing here and I feel justified. These babies would be the best for Christmas morning breakfast! Hey, it’s only 9 months away! Christmas makes me dream of my Crock Pot Cinnamon Roll Casserole. I uttered the words “I’m so over this winter” the other day and remembered how much Mr. Wishes hates when people complain about the weather in Rochester. I’m normally really good about it, but I just have spring fever like it’s nobody’s business! I want to wear all my cute (AKA huge maternity) clothes for the spring. I had a sweet friend, Micah, send me all of her maternity clothes. She is lucky enough to live in Arizona so naturally all of her clothes were cute spring/summer dresses and tops. I hope the weather breaks soon because I’m running out of winter clothes that fit me! 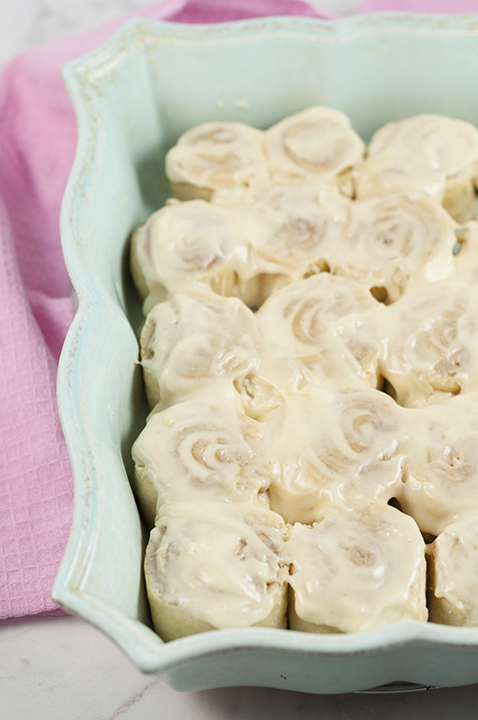 I hope you try these Copycat 1 Hour Cinnabon Cinnamon Rolls. Don’t be intimidated by them at all, my friends. The centers come out perfectly cooked and they rise nicely as they bake. The steps are easy and simple to follow. The hardest part, really, is just rolling out the dough to the right size. You will impress anyone and everyone you make these for! You MUST enjoy these cinnamon buns while they’re warm – that is my only rule. If you’re in the cinnamon roll mood, you have to try my Cinnamon Bun Cake that is wildly popular! I love a cake that can be acceptable for both breakfast and dessert. You should also check out there Cinnamon Roll Sugar Cookies from my friend April. Enjoy! 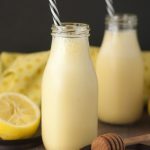 In a mixing bowl, stir warm milk, yeast and 1 tablespoon of the granulated sugar together until yeast is dissolved; stir, let sit for 5 minutes or until slightly bubbly. Using the bowl of astand mixer (or use hand mixer and bowl), add 3 cups of flour, the remaining sugar and salt. Pour yeast mixture into bowl with the dry ingredients. Keep mixer on low setting. Add in the egg and the oil. Scrape edges of bowl with spatula periodically. Knead for 5 minutes on LOW. You can add a couple more tablespoons of flour at a time if dough seems to sticky, until it starts pulling away from the bowl and forming a ball (a little sticky is fine). Let dough sit for about 5 minutes. Preheat oven to 350 degrees. Line a 13x9 baking pan with with parchment paper, spray lightly with nonstick cooking spray;set aside. Sprinkle counter with flour and rolldough to be about 18x24 (a little smaller is fine). Spread the softened butter evenly over dough, going to all eldges. Sprinkle brown sugar and cinnamon mixture onto dough and spread evenly with your hands. Roll the dough up into a tight, even log, finishing with the plain dough; seal edge together. Cut off the uneven ends (if necessary) so the log is uniform. Slice your rolls into 1½ inch rounds and place in pan. Bake about 20 minutes or until tops start to brown lightly. While the rolls are baking, whip cream cheese and butter together in a mixing bowl. Stir in vanilla, corn syrup and lemon juice, scraping down sides as necessary. Slowly pour in powdered sugar and stir until it starts to incorporate. Mix on high for 5 minutes or until frosting is the correct consistency that you desire. Frost slightly warm rolls with half the frosting (it will melt into rolls slightly). Frost again with remaining frosting right before serving. Serve warm! These sound great! Cinnabon rolls are terrific, and now I can make them at home. Thanks! Cinnamon rolls are so worth the effort (and if it only takes an hour?!!). My family loves it and I just made a small batch last weekend. They want it all the time so I’m sure these would be very well received. They look sensational! Oooh I love cinnabon – now I can have it at home! 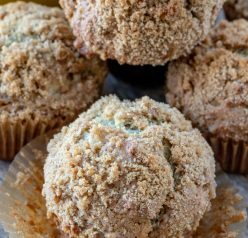 Thanks so much for this recipe Ashley! Very very close to the same recipe I have for a copycat cinnabon recipe. I lost the baking temp and time on mine due to a computer glitch ???? but this will help. Thank you! 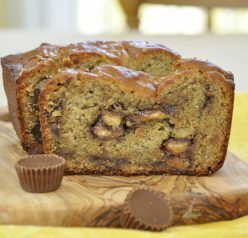 I”ve made my recipe for years and they turn out fantastic every time. So rich and delicious, no one can keep their hands off them. I make them for Easter, Christmas, and 1st day of school, and I”m always both a bit happy and a bit sad when they are gone! So glad I have 4 kids to share them with! My recipe”s dough differs in the flour (4 cups) and I use softened butter. My frosting is different in butter/cream cheese measurements (but yours sounds amazing), and I have heard on other websites a lot of ex-cinnabon employees comment w/1 part cream cheese, 1 part butter, 2 parts powdered sugar, a dash of vanilla and a dash of lemon. Haven”t tried it that way, but something to try. I rise my dough for an hour, fill and cut, then rise them overnight in the pan (I also get 15/16 rolls out of a 12 roll recipe) I bake them first thing in the AM, let them cool a bit and frost. Tasha”s tip about rising dough is one I”ve used in drafty kitchen”s in cool temps and it works great. Hardest part of making these rolls is the waiting! Cinnamon rolls are a favorite at my house. Love that these are ready in an hour. So easy and doable! I need to make these! I can’t believe how fast these are, and they taste fantastic!